With a breathtaking location at the tip of the South Malé Atoll, Adaaran Club Rannalhi is the perfect relaxing retreat. 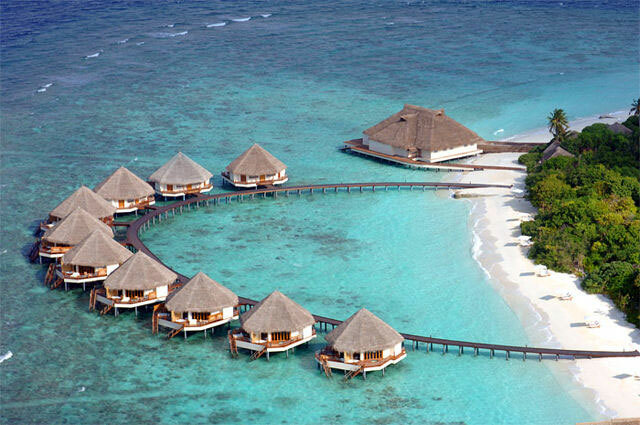 Set amongst the idyllic islands of the Maldives, it provides panoramic views of this tropical paradise. Make the most of this truly unique spot; bask in the golden sun and relax on the soft sands just steps from your room, or switch off in the in-house spa. Stay in a comfortable guest room, or upgrade to a stunning water bungalow. Dine on the finest local delicacies at the open-air restaurant, and finish your day with a classic cocktail at the lounge bar. Choose from an array of water sports. Try scuba diving, deep sea fishing, or head to Malé, only a 45-minute speedboat ride away. This Maldives resort is laced with soft, white sand and palm trees, making it the ideal exotic hideaway. The Adaaran Club Rannalhi offers everything you'd expect from a Maldives hotel. First up, the sumptuous spa and reflexology centre boasts a variety of nourishing treatments, including body wraps and massages. Then there's an extensive choice of water sports. You'll also find a gift shop and a great selection of excursions, bookable through the reception. The main restaurant at Adaraan Club Rannalhi serves a wide menu of Maldivian cuisine in its open-air dining venue. Dine on diverse dishes from breakfast to dinner with local delicacies, fresh seafood and international favourites. Spend your evenings in the Nika Lounge Bar, sip a cold beer or non-alcoholic cocktail while admiring spectacular views of the sunset. In-room dining and private candlelit beach dinners are also available. When it comes to water sports, Adaraan Club Rannalhi has plenty to choose from. Think deep sea fishing, windsurfing, snorkelling, scuba diving, and water skiing. On dry land, enjoy beach volleyball, beach football and table tennis. This Maldives hotel's proximity to the capital Malé means that brilliant shopping opportunities and popular whale submarine safaris are within easy reach. All rooms at the Adaaran Club Rannalhi offer the kind of facilities you'd expect from a Maldives resort. As well as wonderful views of the lush tropical gardens or the Indian Ocean, you'll find bright décor, air-conditioning, minibar, a double bed, satellite television, telephone, safe, and tea/coffee making facilities. For an extra special getaway, upgrade to one of the resort's stunning water bungalows.